Help promote Florida's Sea Turtle License Plate by placing a banner on your website! The Sea Turtle Conservancy developed a poster that can has been provided to DMV offices and can be used in sea turtle & nature visitor centers, and at events. If your group would some free posters to display, distribute, or provide to your local DMV, please submit a Materials Request Form. The Sea Turtle Conservancy developed a bumper sticker to promote the purchase of the turtle license plate. These can be distributed at visitor centers and events. If your group would like some free bumper stickers to give out, please submit a Materials Request Form. The Sea Turtle Conservancy (formerly the Caribbean Conservation Corporation) developed a tabloid sized poster that has been provided to DMV offices and has been used in sea turtle & nature visitor centers, and at events. In response to requests for a handcard that would encourage switching to the Sea Turtle License Plate during vehicle tag renewal, the Sea Turtle Conservancy (formerly the Caribbean Conservation Corporation) developed a handcard that was included in renewal notices, as well as being available at DMV offices, sea turtle visitor centers, and events. Special thanks to Chris Johnson / www.turtleimages.org for donating the hatchling image! 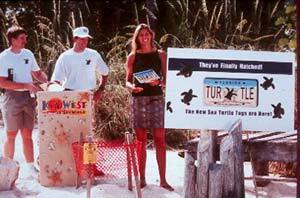 As a way to promote the Sea Turtle License Plate, the Sea Turtle Conservancy (formerly the Caribbean Conservation Corporation) developed a small sticker that can be given out by sea turtle groups while on the beach during nesting monitoring, at walks or presentations, or at events that promotes supporting Florida's sea turtles and the Florida Sea Turtle Plate. As a way to thank people and promote the Sea Turtle License Plate, the Sea Turtle Conservancy (formerly the Caribbean Conservation Corporation) developed a cling sticker that was mailed to people who had purchased the Sea Turtle Specialty License Plate. These cling stickers can be given out by sea turtle groups at presentations, walks, visitor centers, or events to help promote helping Florida's sea turtles through the purchase of the Florida Sea Turtle Plate. In response to requests from groups wanting to promote the Sea Turtle License Plate at their local DMV office, their own office or visitor's center, and at events they attend, the Sea Turtle Conservancy (formerly the Caribbean Conservation Corporation) developed a one page flyer that can easily be copied for use in promoting the plate and how the funds are used to benefit Florida's sea turtles. The Sea Turtle Conservancy (formerly the Caribbean Conservation Corporation) and the Florida Marine Turtle Protection Program developed a promotional poster using a photo by Dr. Blair Witherington (FWCC). This poster was distributed to county tag offices throughout Florida, with a focus on coastal counties. It was also distributed to Florida's sea turtle groups to help increase awareness about the new sea turtle license plate in sea turtle nesting areas. It is no longer distributed and has been replaced with the Tabloid Poster above.